The data security market is estimated to be worth in excess of $202 Billion by 2021, growing at an annual rate of 9.8%. The number of seven-figure deals alone has grown by 40% year-on-year since 2010. With more data online now than ever before, the importance of securing and protecting your data from destructive forces and the unwanted actions of unauthorised users, has never been more important. Some common measures taken to secure data include scrambling, where data is rendered unreadable to unauthorised users and hackers, and locking computer systems with a password and installing a firewall system. Organisations can also consider imposing non-disclosure agreements for users of confidential data, and reminding them not sending personal or confidential data via email or other file transfer means without first encrypting them. As a last resort data can be destroyed when needed. The data security field is also of growing importance due to the growth of smart devices, including smartphones, televisions as part of the Internet of Things. With these new technologies comes new risks and threats which have to be defended to protect sensitive information. Organisations are having to boost their security budgets and adopt new innovative technologies to respond the rising risks of cyber crime. WHAT ARE THE INFLUENCERS SAYING? We reached out to some of the top influencers on our list to ask them for their views on data security. We spoke to Fabienne Neymarck (#2), Dr. Carlo Piltz (#3), Bill Kleyman (#4), Giovanni Buttarelli (#7), Lisa Briercliffe (#8), Evan Kirstel (#11), Jonathan Armstrong (#14), Kirk Borne (#16) and Tripp Braden (#18). Be sure to follow them to stay up to date on the best content and resources on data security. We were interested in seeing which topics were most popular among the top data security influencers, so we analysed their tweets and blogs from 1st January – 9th August 2016 and counted mentions of various topics associated with data security, which we then used to create a topic share of voice chart. 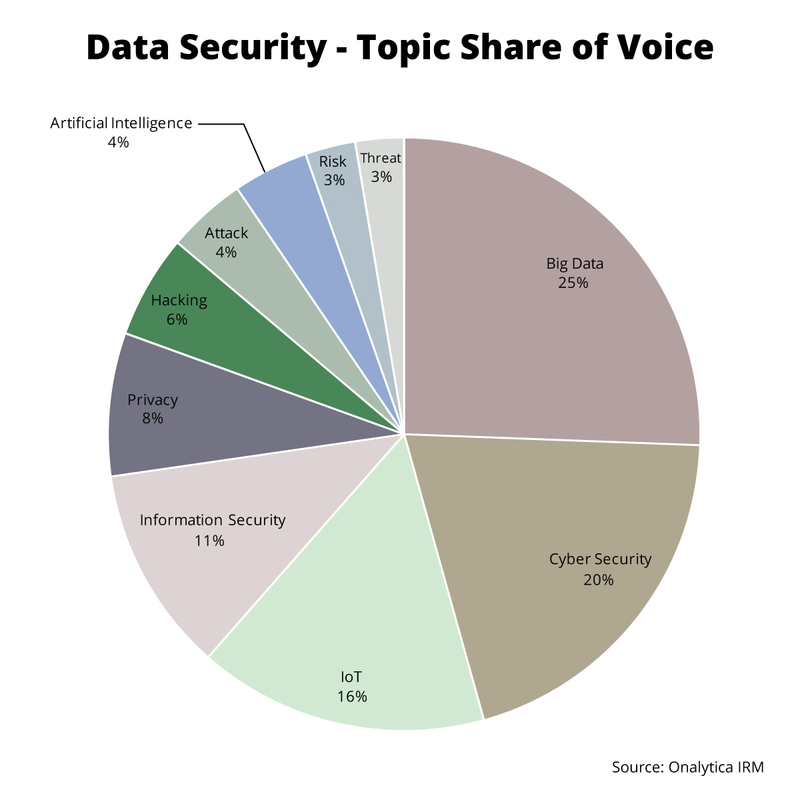 It’s interesting to note that the most popular topic among the data security influencers was Big Data with a 25% share of voice, illustrating the fact that big data and its use within the data security sector is a key debate driver among the top influencers. Cyber Security was the 2nd most popular debate driver with 20%, followed by mentions of IoT with a 16% share of voice, illustrating the level of perceived threats within the IoT sector. Information Security received an 11% share of voice followed by Privacy with 8%. Other frequently mentioned topics among the top influencers included Hacking, Attack, Artificial Intelligence, Risk and Threat. We were very interested in seeing which Data Security influencers and brands were leading the online discussion, so we analysed tweets over the last 6 months mentioning the keywords: “data privacy” OR dataprivacy OR “data security” OR datasecurity OR datasec OR “data protection” OR dataprotection. We then identified the top 100 most influential brands and individuals leading the discussion on Twitter. What we discovered was a very engaged community, with much discussion between individuals and brands. 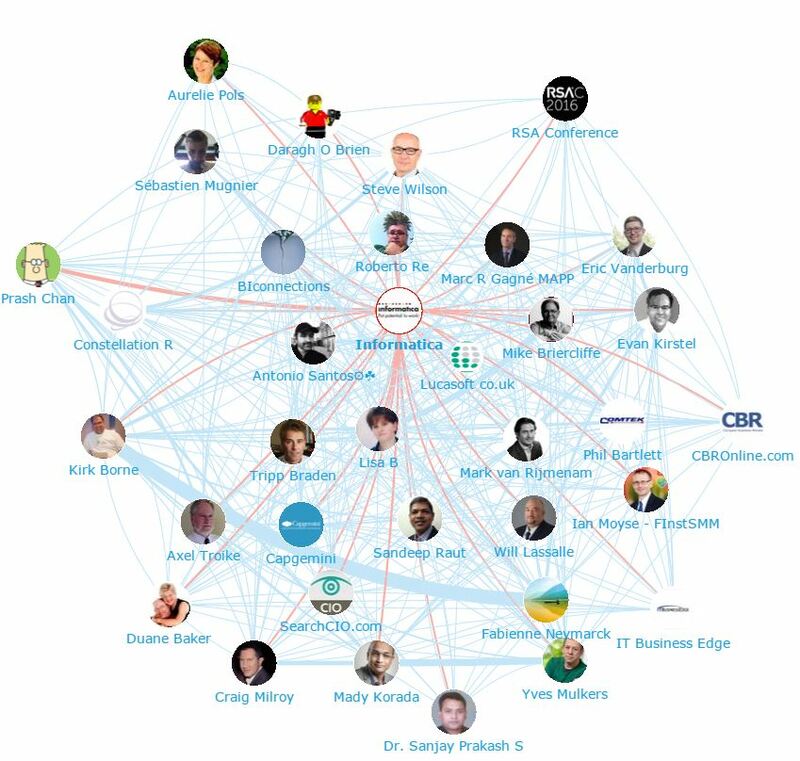 Below you can see a network map of the online conversation with the influencer Eric Vanderburg at the centre. This map was created with our Influencer Relationship Management software (IRM). Be sure to click on the map to enjoy the full size network diagram in greater detail. Below you can see another network map created with our Influencer Relationship Management software (IRM) showing the number 1 brand Informatica at the centre and all the conversations to and from the influencers in their field. If you are interested in learning more about identifying, managing and engaging with influencers click here to get in touch! 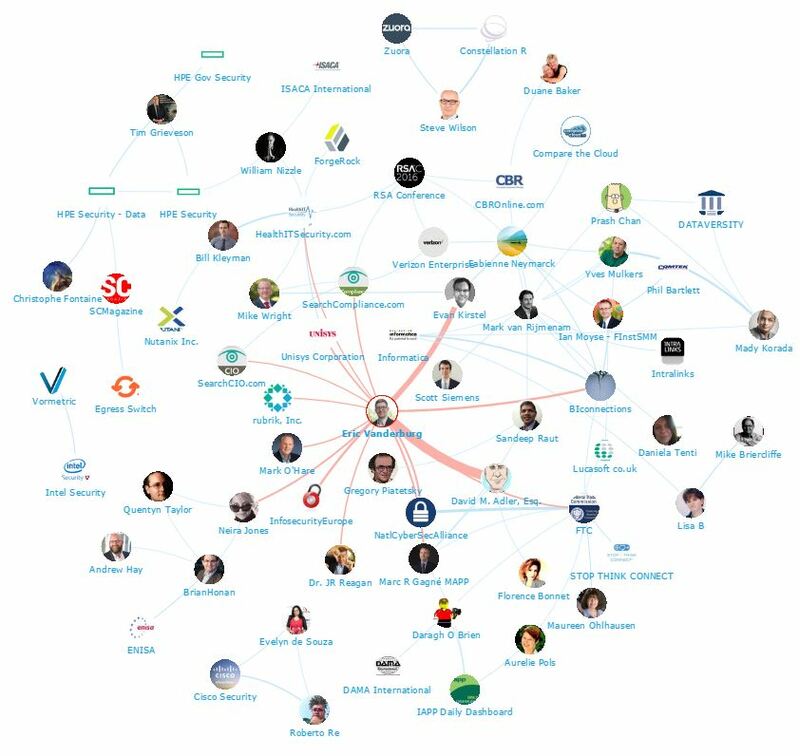 We looked at all the individuals engaging on Twitter to bring you a list of the top influencers in Data Security. Below is the top 50, if you want to see who ranks from 50-100 be sure to download the full report by clicking the download button below. 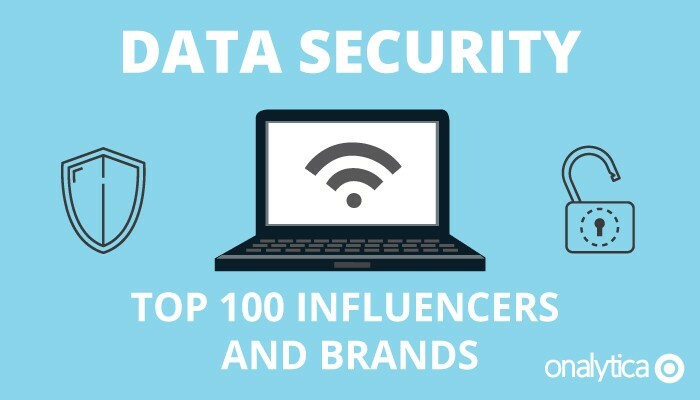 We also looked at all the brands engaging on Twitter to bring you a list of the top data security brands. Below is the top 50, if you want to see who ranks from 50-100 be sure to download the report to get the full top 100 list, and see who are most the influential brands in data security. Disclaimer: As ever with these lists, it must be stressed that the ranking is by no means a definitive measurement of influence, as there is no such thing. The brands and individuals listed are undoubtedly influential when it comes to driving discussion around Data Security.